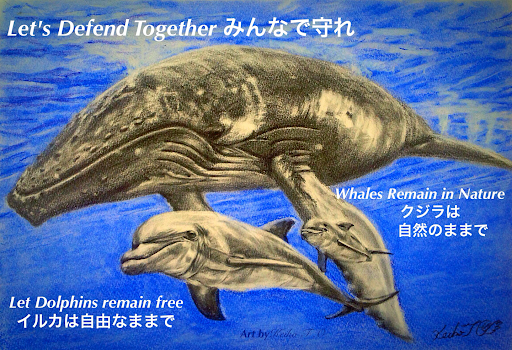 Save Wonderful Nature and Animals + ART: Part ⒈ Whales Remain in Nature, Dolphin Remain Free. Massage to the world from Japanese Activist. Part ⒈ Whales Remain in Nature, Dolphin Remain Free. Massage to the world from Japanese Activist. Part 1. Let's Defend Together. Part 2. What they has to say.Wakayama prefecture Senator and Mayyor of TAIJI. Today, towards the start of the scientific whaling that assess the impact on coastal fisheries by minke whales in Hokkaido Kushiro (９／５), the ceremony was held in Kushiro Port. This research of whaling, boarded the six sailors from fishing cooperatives of Taiji. Wakayama Prefecture "Dainana Katsumaru " also participate together with Miyagi Prefecture and Chiba Prefecture on a small whaling ship. They hope to research whaling on the four ships. The four vessels that had planned to sail today because of the bad weather, it was postponed the departure. There were Four ships of the whaling ship. 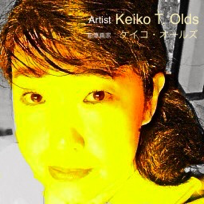 The coast of radius approximately 90 km with a focus on Kushiro Port. One is able to capture a maximum of 51 animals by the end of next month. Tomorrow or later, they begin as planed. 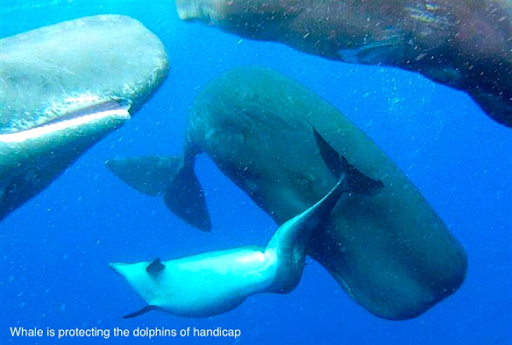 For the captured mink whale, they have decided to investigate the type and amount of fish that the whales eat as food. The International Court of Justice has ruled that they restrict the Antarctic Ocean scientific whaling project of this year beginning March. The research of whaling is carried out in Kushiro for the first time. I have been opposing whaling and dolphin killing. Although the reputation of the movie has increased, I have not seen The Cove movie until recently. I had imagined a different image based on what other people had told me of the movie. When I actually watched The Cove and story wasn't ranting or blaming about the fishermen, its purpose was to inform the world of the their doing towards Dolphins in Taiji. It included the Nature and ecology of dolphins. But it also was a great documentary film that appealed the right to life of the dolphin. On the Wakayama governor's homepage, reports that the movie took pictures using a hidden camera, but in every documentary, there is always a hidden camera to ensure raw footage. Of course, the slaughter scene's painful scene, but I think I've seen a lot of slaughter scene in order to uncover the animal cruelty of the American factory farm and something everyone should see once in their lifetime. The Cove movie urges the audience that the dolphins should remain wild. The dolphins spend a lifetime in the narrow pool or sold alive, and are unhappy as well as stressed. The Movie explained about how TAIJI was selling dolphin meat, but it revealed mostly that Dolphins were being sold alive across the world. Rick O'Barry caused a boom of the dolphin popularity during the old days as a dolphin trainer of the TV drama "Flipper" which was popular show in Japan as well as around the world. 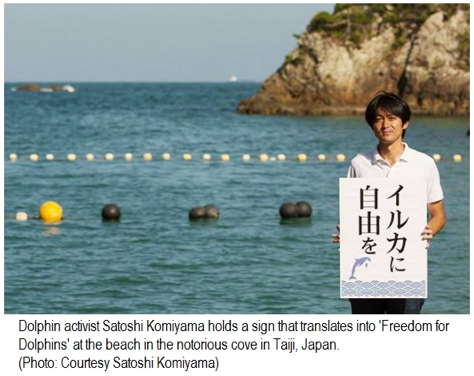 He hopes that the captured dolphins will be free for the dolphins to finish their short lives with stress. The capture of the Taiji dolphin has hurt his heart due to the act of Uritobasu to Aquarium of the circus as animal trafficking. A few years ago, dolphins from Taiji were sold to aquariums for around 100 million 50 million yen. Dolphins that he sell 10 million or more per head. Dolphins of Taiji's sell well in overseas. Whaling countries such as Japan was believed to have the best common sense of the world, but it showed that of whaling in the Southern Ocean using a large ship. They never thought that Taiji would be catching Dolphins as well as fish. It was never captured until the small fishing village taking whales from the seas was not known to most people. The media shows small amounts of whale hunting Taiji screenings, but The Cove has been performed in many parts of Japan has become the villain to the Dolphins. I am very sorry because of the Dolphins whom suffer during the capture. And recently, I have seen the "Living with the whale" Japanese national broadcaster NHK documentary drama. Sea Shepherd and the anti-whaling organization are against the people of dolphin hunting in Taiji and has been long trying to interfere with it. It was something that drew the lives of the people of Taiji. 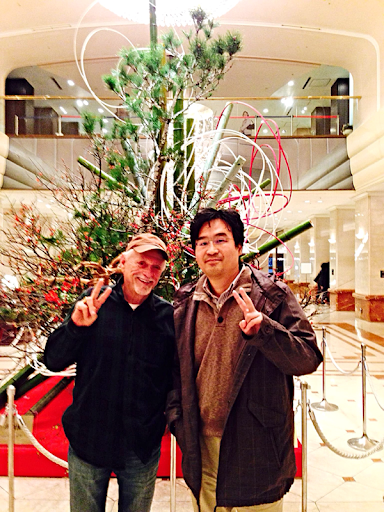 I am also Japanese, and I understand what Taiji is going through and their pride of traditional hunting. They do not know why people are opposing their way of hunting whales. "Are Pigs and cows allowed to be killed? Are other countries allowed to kill dogs? Why are we not allowed to kill smart animals like Dolphins? 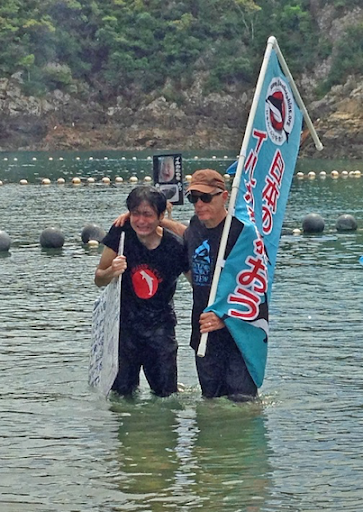 What can we do to make anti-Taiji understand our way of life?" This quote was said by a beautiful daughter of a fishermen. This scene was quite moving and embedded with question as well as sadness. However, it's unfortunate that the NHK documentary I did not mention the sale of dolphins in Taiji. Nor did they mentioned Rick O'Barry. Only harassment behavior and rants from the Sea Shepherd was emphasized. Whales arrived on land about 50 million years ago. Then, about 30 millions ago, they returned to the sea. This rapid evolution is mind boggling and to think they are living to this day is quite an extraordinary thought. Mankind has arrived 40-50 thousand years ago, but compared to whales, humans has significantly below the times of whales. Whales are a living fossil, and has lived thousands of years. It has owned the ocean ecosystem. The same as human beings have been living in the land, sea organisms have been living in the sea. Similar family life of people, education, joy, sadness and drama of the whales is not visible to humans because we treat them as a meat source. Animals and nature has increased people to notice and should not be destroyed by human beings. Wild animals is something to protect as well as the natural environment rather than treat it as human resources. Just because people say Dolphins and whales eat too much of their fish, it is not our decision to determine the population of these animals and attempt to control it. Nature is to be kept by the power of nature. It will balance by its self. Even if it increases in population, it will go back to normal. Before human appearance, it has always kept the earth populations under control. Whales obviously relies on the ocean for their food source. Humans should not forcefully take from the sea, claiming it is their own. People should share the seas with the whales and dolphins and take only what the sea allows. 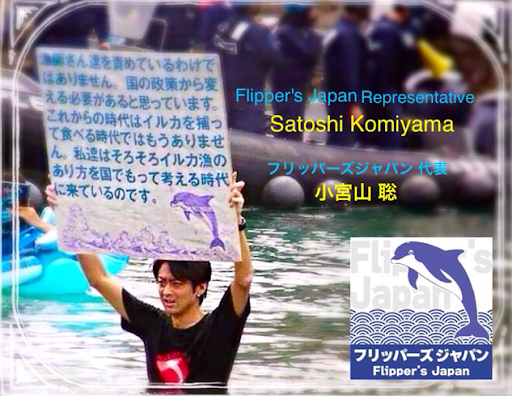 ★I introduce the activists who tries Protect the Japan of whales and dolphins here. Q : Why do you want to protect the whales? 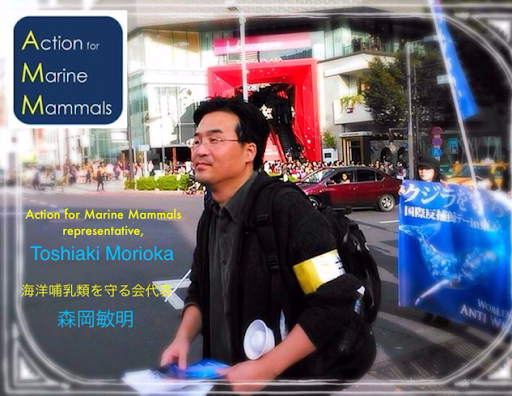 Morioka : In the beginning, I did not only protect whales but I began to want to protect the lives of all animals. I began the activities and projects of protection of the marine animal as one of its activities. Initially, in Japan, there were many animal welfare organizations. The activists of the organization that began to protect the marine animal rights did not exist. So, in September 2012, a dozen of activists and I launched one of the meetings in which many people gathered. 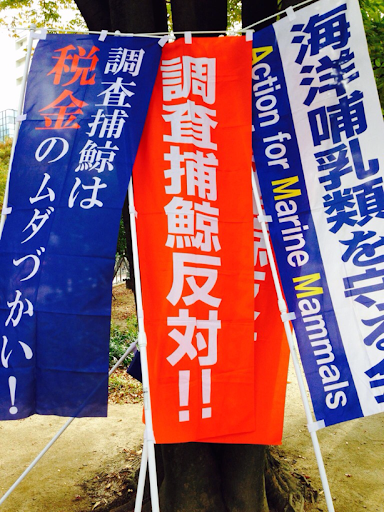 It is the current "Action for Marine Mammals (AMM)". Even now, we will, on a regular basis activities protect the right of whales to live freely. Morioka : Maintain unity and solidarity! Let's fight together for the whales release. ★Like many Japanese activists, seeing the Academy-winning documentary “The Cove” was, for me, a wake-up call to the horrible problem of the dolphin drive hunt in Japan. Until then, we Japanese knew little more than the rest of the world about what went on in that cove in Hatajiri Bay. In this regard, we are deeply grateful to, and hold in high respect, Ric O’Barry and the other activists who created the movie. It is no exaggeration to say that the Tokyo-based group “Action for Marine Mammals” owes its foundation to the enlightenment that their activism brought us. Currently our work centers on opposing the dolphin drive hunts, ending whaling in the Southern Ocean and saving captive marine mammals forced to perform for entertainment. 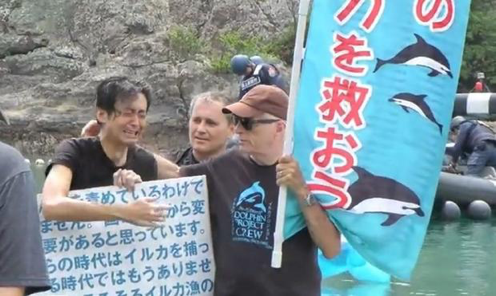 One fundamental difference between the situation in Tokyo and that in Taiji is that Japanese activists are working independently to end the dolphin drive hunt. It goes without saying that the center of dolphin drive hunting is Taiji in Wakayama. However, regardless of how closely the activity in this remote village is monitored, the situation remains unchanged. For foreigners to lecture the fishermen on the inhumanity of the hunt is meaningless. 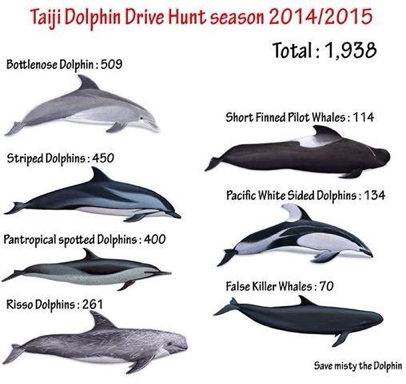 While there is demand (dolphin shows), there will also be a supply (drive hunts). While they have permission to kill some, they will continue to eat dolphin meat. The source of that permission is the government in Tokyo. If there is no change in Tokyo, there will be no change in Taiji. If we cannot reform the center of the nation, awareness and institutions in the provinces will not change either. Sad to say, that’s what kind of country Japan is these days. There is something I’d like to say to the Cove Monitors of SJD, the Cove Guardians of SSCS and other such organizations active in Taiji. It is not seen as normal, legitimate or even acceptable for overseas activist groups to operate in this remote corner of Japan as if it were their own backyard. The current presence and activities of monitors do nothing but contribute to anti-Japanese prejudice, discrimination and hatred. This is neither necessary nor even useful. 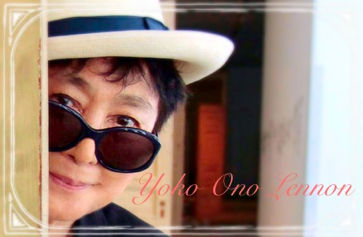 If you think you are supporting Japanese activists, you are gravely mistaken. Some of your efforts have already been interpreted as an attempt to create an apparently Japanese puppet organization. If you were to view the problem from the other side you would easily understand why the people of Taiji have so far resisted your efforts. 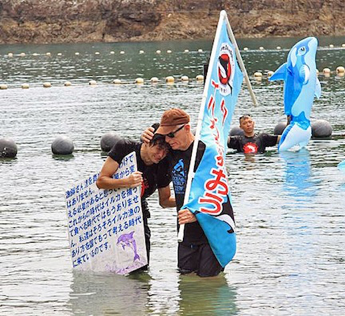 Isn’t it time to give serious thought to the sad situation that the efforts of overseas activist organizations in Taiji are having the reverse effect? Instead of hiding your light in this remote corner, why not come to Tokyo and boldly address the government in Kasumigaseki? How about protesting the dolphinariums that are the root of the problem? Why not enlighten the general Japanese public to the problem? There are other places to go and work to be done. Attention needs to be paid to the fact that the root of the crime is not the same as the scene of the crime. 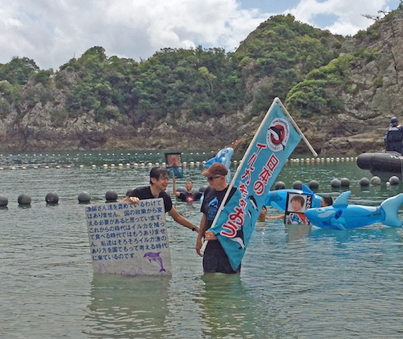 In fact, there is nothing left to do at the cove in Taiji that requires overseas activists. I beg you to leave Taiji. If you wish to save the dolphins of Japan, I hope you will cross the fences between organizations and the walls between nations, and combine your efforts with those of Japanese activists here in Tokyo. Together we can change Japan. About the current status of dolphin. In a democracy, the minority opinions does not resolve any problems. Through the activities up to today, I have found that most of the Japanese do not know the dolphin hunting. Most of the people shows the reaction of "is that a true story?" And "incredible", "poor animals" is returned as an answer. I feel great hope in this reaction. First of all. to many Japanese people, get to know the the exact information about the dolphin issue and you are already one step toward improvement. Looking at the current situation of oversea countries, there are more people who knows about dolphin hunting more than people in Japan. Overseas. The dolphin problem is featured in television and newspapers. It is, therefore, considered that the oversea activists can become a major force. In Japan, dolphin hunting is rarely brought to the headline news of TV and newspaper. Many Japanese do not know the exact information about the dolphin hunting, killing and aquarium trafficking. No way, it is to be captured from the sea. It is something you do not think about. 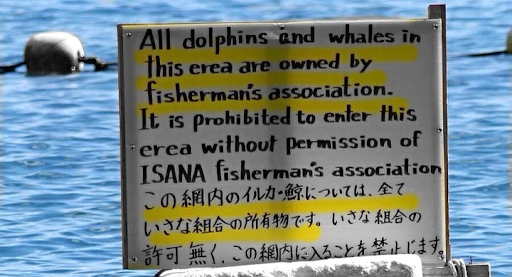 About the dolphin issue, and awareness of overseas, given the current state of Japan domestic awareness, the start line to stop these dolphin issues would not have occurred. 55 aquariums has over 582 dolphins are housed (* Sakae Henmi Yukari Sugisaka "Japan's dolphins have been bred at the facility"). 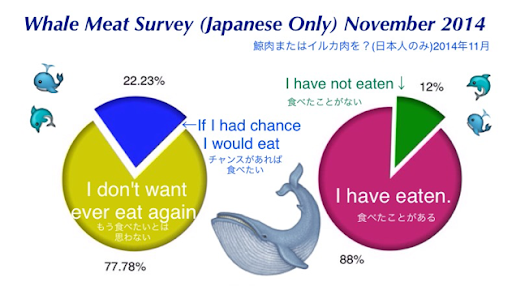 This is a 2013 survey result. Currently, it is said to have increased to more than 600 animals. This in such circumstances, the construction of a new aquarium in Sendai, Miyagi Prefecture, And it is progressing to be build in 2015 spring. 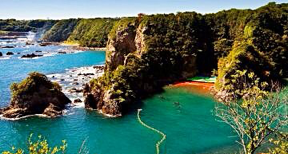 In Taiji, Wakayama Prefecture, has plans to underway a "Whale Pond". Still, the capture of dolphins is most likely to continue. 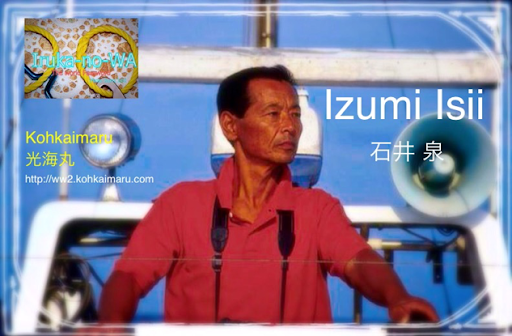 Third-generation fisherman of Ito. She had been dolphin hunting. In response to the increase in dolphin fishing quotas ,during '96 in Futo, a decision was made to stop the dolphin fishermen. Until then, she thought it was "sad to see the Dolphins die, but it was for the sake of our living". With her hands together in the mind, she looked back and a "flood of emotions began to arise in the wake of this incident and [she] knew she to make a change". Before, she found out from her grandfather that he too, thought that dolphin killing was a sad thing. She will continue working with the fishing boat and dolphin watching. Please see the interview video. I understand how you must feel about the one-sided-ness of the West to be angry at your traditional capture and slaughter of Dolphins. But that tradition was made only when the world, and Japanese Fishermen did not know what it meant to do harm to the Dolphins. I'm sure you have heard so many speeches in which all of these things have been discussed. So I will not bore you with it. But I think you should think of this situation from the point-of-view of the big picture. Japan has gone through such hard times lately. And we need the sympathy and help of the rest of the world. It will give an excuse for big countries and their children in China, India and Russia to speak ill of Japan when we should be communicating our strong love for peace, not violence. I am sure that it is not easy, but please consider the safety of the future of Japan, surrounded by many powerful countries which are always looking for the chance to weaken the power of our country. The future of Japan and its safety depends on many situations, but what you do with Dolphins now can create a very bad relationship with the whole world. For many, many years and decades we have worked hard to receive true understanding of the Japanese from the world. And, because of our effort, Japan is now respected as a country of good power and ingenuity. This did not happen without our efforts of many decades. But what we enjoy now, can be destroyed literally in one day. I beg of you to consider our precarious situation after the nuclear disaster (which could very well effect the rest of the world, as well). Please use political tact and cancel the festival which will be considered by the rest of the world as a sign of Japanese arrogance, ignorance, and love for an act of violence. Japanese whaling ships returned home from the Antarctic on Saturday for the first time in nearly 30 years with no catch onboard, after a UN court ordered an end to their annual hunt, local media reported. The two ships -- the 724-ton Yushinmaru and the 747-ton Daini (No 2) Yushinmaru -- arrived at a port in western Shimonoseki city, a major whaling base. It was the first return by Japanese whalers without catching any whales since 1987 when the country began the annual "research" hunt in the Antarctic, the Asahi Shimbun said. The two ships did not face any attacks by anti-whaling activists during their three-months voyage, the daily added. Tokyo had said this season's excursion would not involve any lethal hunting. Harpoons normally used in the capture of the giant mammals were removed from the vessels. Crew members on the two boats carried out "sighting surveys" and took skin samples from the huge marine mammals, news reports said. The non-lethal research came after the International Court of Justice -- the highest court of the United Nations -- ruled in March last year that Tokyo was abusing a scientific exemption set out in the 1986 moratorium on whaling. The UN court concluded Tokyo was carrying out a commercial hunt under a veneer of science. After the ruling, Japan said it would not hunt during this winter's Antarctic mission, but has since expressed its intention to resume "research whaling" in 2015-16. In a new plan submitted to the International Whaling Commission (IWC) and its Scientific Committee, Tokyo set an annual target of 333 minke whales for future hunts, down from some 900 under the previous programme. It also defined the research period as 12 years from fiscal 2015 in response to the court's criticism of the programme's open-ended nature. "By collecting scientific data, we aim to resume commercial whaling," agriculture, forestry and fisheries minister Yoshimasa Hayashi told reporters in the city as he attended a ceremony for their return.